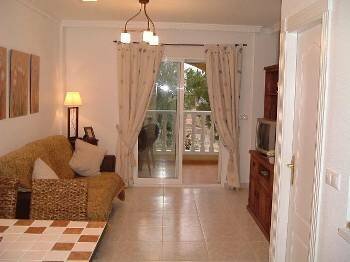 Wonderful townhouse with communal pool and all mod cons, surrounded by mountains, lakes, beaches. 5 Championship golf courses within 5-10 mins. The house has been furnished to high standard.Enjoy eating or drinkinkg at the dining table,on the balcony or on the roof terrace.The living area balcony has shade during the hottest part of the day and is a perfect place to eat have a drink and escape the sun. Lets get the kids to bed! The twin room is a relaxing place to sleep and has a window overlooking the pool.There is a very comfortable sofa bed in the living area for 2 more.The master bedroom has a large balcony which gets the sun virtually all day,has extensive views and provides access to the roof terrace. The front of the house overlooks the entire pool area.The kids can play while you watch from the front patio. We have Wifi and internet TV so you dont even have to get behind with the soaps or footie!Ther is also a DVD and a selection of films to watch. In the immediate area you have an excellent tennis facility with floodlit courts,swimming pool and bar/restaurant.Why not try the meal of the day there-choice of starter,main course,desert and a bottle of wine or sangria and cafe con leche for 7 euros a head(having some Spanish will help-very Spanish). Across the road from the house is La Finca Golf Club.Wonderful golf on a future Ryder Cup course or a meal in the restaurant or a drink on the terrace. There are also bars and restaurants and some small shops a 15 minute walk away or 3 minutes in the car. Great food and entertainment. At the house you will find some directions to restaurants,markets,beaches and the golf courses in the area.